People who often run or walk briskly seem to possess healthier discs in their spines than folks that do not stay active or do not exercise. The human spine is a complex mechanism, consisted of bones and discs in between. These discs, formed like little cushions, contain a viscous fluid that compresses and absorbs pressure throughout the movement, keeping the back in good shape. Slower walks and standing in place were not as effective. 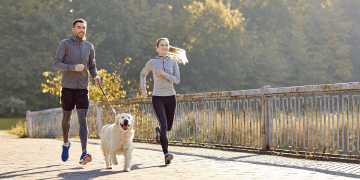 The sweet spot for the spinal disc health is somewhere between fast walking and jogging. You may run if that is what your preference is, but a fast walk is all your spine needs to be healthy. Of course, jogging, fast walk, or running isn’t a treatment for your spinal disk health issues, but it definitely helps in maintaining that needful balance of a healthier “spine mechanism”.